I’ve basically had a headache for 10 days now (thanks a lot stress), so apologies for the lack of new recipes. It hasn’t been for a lack of baking – I’ve got recipes and photos coming out of my ears, but concentrating for long enough to actually sit down and write something has been a struggle. But, assuming you are reading this right now, it must mean I actually managed it. Go me! 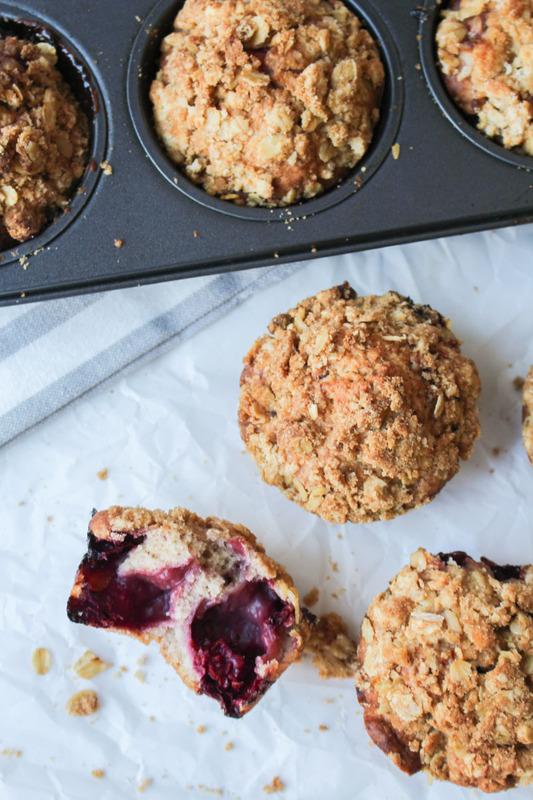 These muffins are blackberry apple crumble in cake form. Packed full of your favourite fall fruit, and finished off with a crispy crumble topping for good measure. I guess you would leave this off if you wanted to – but why? I’d like you to imagine that I went out and picked the blackberries from the beautiful Somerset hedgerows, whilst little squirrels hopped past and baby hedgehogs snuffled around. And that the apples had freshly fallen from a beautiful apple tree in my parents’ orchard. Oh, the autumn feels. What actually happened was a trip to Waitrose, where the blackberries are absolutely massive. I guess that’s what happens when they are grown in greenhouses, but it makes me feel a bit weird. If you are using shop-bought blackberries, then please make sure to chop them in half, as otherwise you are going to end up with massive holes in your muffins (see above). Still tasty as anything though. I chose against using muffin cases for these, but by all means do so if you want. These muffins can be a little juicy, so it will help to avoid lots of stickiness and extra washing up if you do. I wanted to make these primarily as a breakfast food, and for some reason I don’t feel right eating anything out of a cupcake case that early in the morning. It just feels wrong. 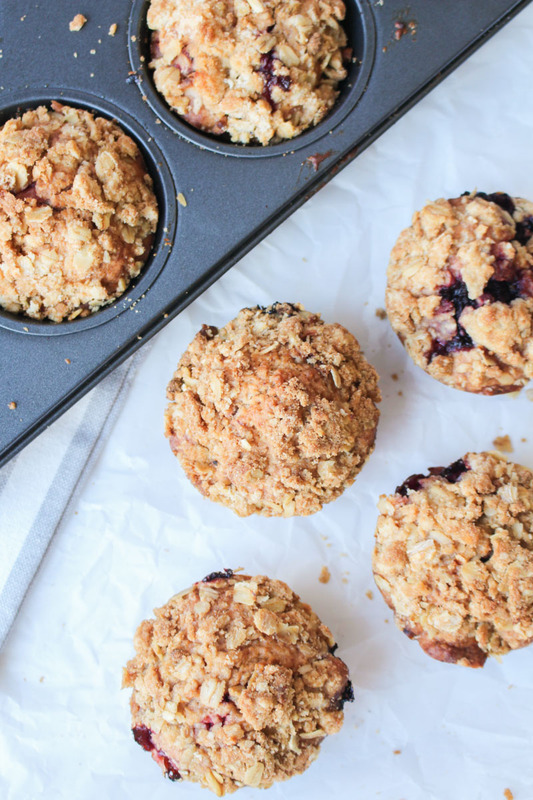 The recipe below uses the ‘really hot oven for 5 minutes’ method which helps to make your muffins rise a bit taller, which you are definitely going to want to use here due to the crumble topping weighing everything down. It works wonders for my double chocolate muffins too. They are most definitely not for breakfast. These muffins are best served with a dose of cute autumnal photos on tumblr, and thoughts of the dark evenings and Christmas songs just on the horizon. Let’s hope this headache is gone by December. 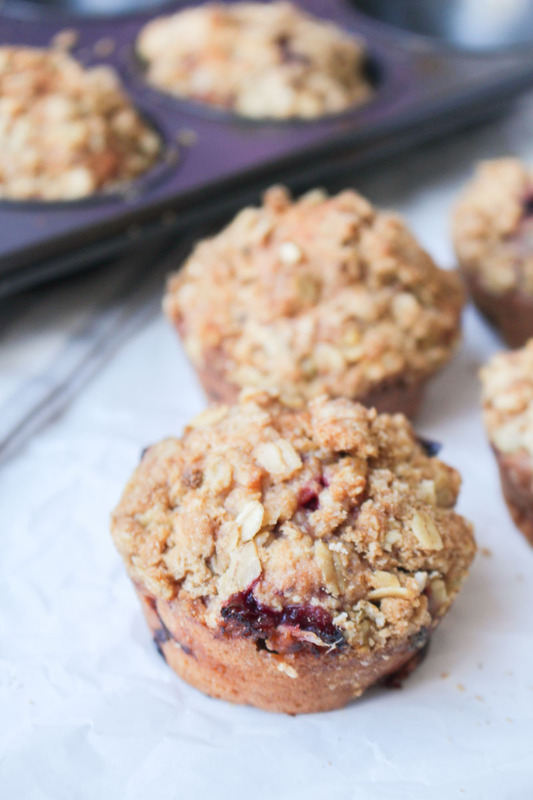 Perfectly autumnal muffins, filled with sweet fall fruits. Have one (or three) for breakfast, or just as a mid-morning treat with your pumpkin spiced latte. Preheat the oven to 210°C / 410°F (190°C fan) and grease or line a muffin tray. Peel and chop the apples, and chop any large blackberries into smaller pieces. Set these aside for later. Put 55g butter and caster sugar into a large bowl, and beat well until light and fluffy. Add the egg, and beat until the egg is fully mixed into the batter. It may curdle slightly, but don't worry. You can add a little flour to try and combat this if you like. Add the 175g flour, baking powder, salt, and cinnamon to the bowl, and gently fold together until it is pretty much mixed together. Don't over-mix here. Add the vanilla extract, milk, chopped apples and blackberries to the batter, and gently fold together until the liquid is fully incorporated and the fruit is well distributed. The batter will probably turn a nice purple colour. Scoop the batter into the prepared muffin tray, making sure to fill each muffin three quarters full. Set aside whilst you make the crumble topping. Place 50g flour and 40g butter into a bowl and mix together well. It should look like breadcrumbs once finished. Add in the oats and brown sugar and stir together until well mixed. Spoon the crumble topping onto the unbaked muffins, making sure to coat each muffin top well (see pictures above). Press down slightly with the back of a spoon to make sure the crumble mixture sticks. 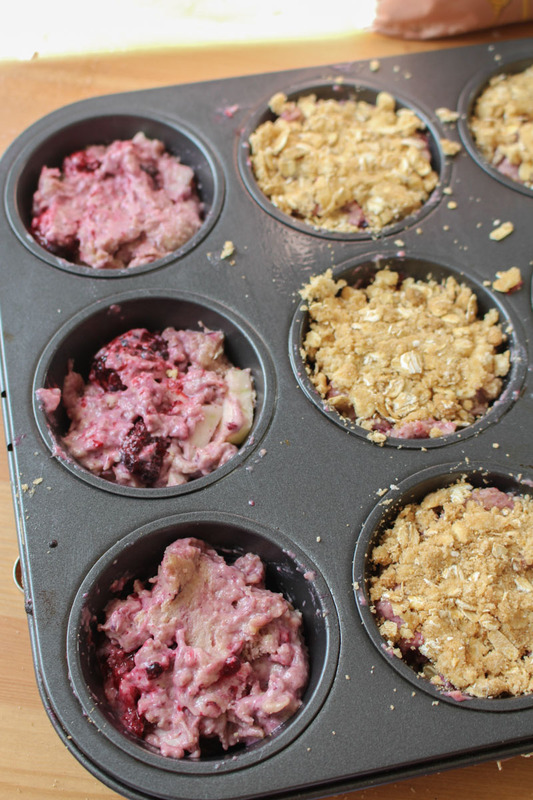 You may not use all the crumble topping, depending on the size of your muffin trays. Bake the muffins in the oven for 5 minutes, and then reduce the temperature down to 190°C / 375°F (170°C) for the remaining 20 minutes. The muffins are ready when a skewer or toothpick (or knitting needle in my case!) comes out pretty much clean - avoiding any fruit. Leave to cool in the muffin tray on a wire rack. These muffins will stay good for 3-4 days if stored in an airtight container. There is no need to keep in the fridge - especially this time of year! The baked muffins will freeze well for 2-3 months. Defrost at room temperature and then eat within a couple of days.